This election takes place amid a time of crisis. America has been caught in the fallout of the French Revolution, and finds itself in an undeclared war with Napoleonic France, which has been meddling in American domestic affairs, and harassing American merchant fleets. President John Adams has drawn fire from both major parties for his responses to French aggression. The Jeffersonian Republicans have gathered their energy from their fierce opposition to the Alien & Sedition Acts, while the Federalists have attacked Adams’s independent streak, and his desire to achieve peace with France. As such, Jefferson and Madison work to orchestrate a Republican Revolution, while Hamiltonian Federalists secretly wish to replace Adams on the ticket. Another foreign policy issue facing the candidates is the increased attacks by Barbary Pirates. Should the US increase it’s navy? Should the US attack the pirates with the navy they currently have? Domestically, one of the major issues, outside of the domestic realm of the Alien & Sedition Acts, is the question of expanded suffrage. Should more states allow a popular vote? Should the government sell cheap Western property to grow the voting pool? Should those without property be allowed to vote? Also dominating the headlines is the New York power struggle between Aaron Burr and Alexander Hamilton, as both hope to position New York for their respective parties for the 1800 election. Internationally, Napoleon dominates the news. This election is also the last election under the old electoral system. Electors vote on both the president and vice president, which had lead to Adams and Jefferson serving on the same ticket in 1796, despite memberships to different parties. John Adams’s pessimism was well-founded. While he was able to upset Hamilton’s scheme to place Pinckney at the top of the ticket, Federalist in-fighting hampered Adams’s election chances, and while Adams restored his popularity with establishing peace with France, the news came too late to help Adams win reelection. Jefferson’s popularity was such that his election was believed to be very certain. Despite this relative certainty, Jefferson’s allies held no punches during the campaign against Adams. Likewise, President Adams’s allies responded in kind, in what was a very nasty campaign, full of ad hominum attacks. This election did not go smoothly. 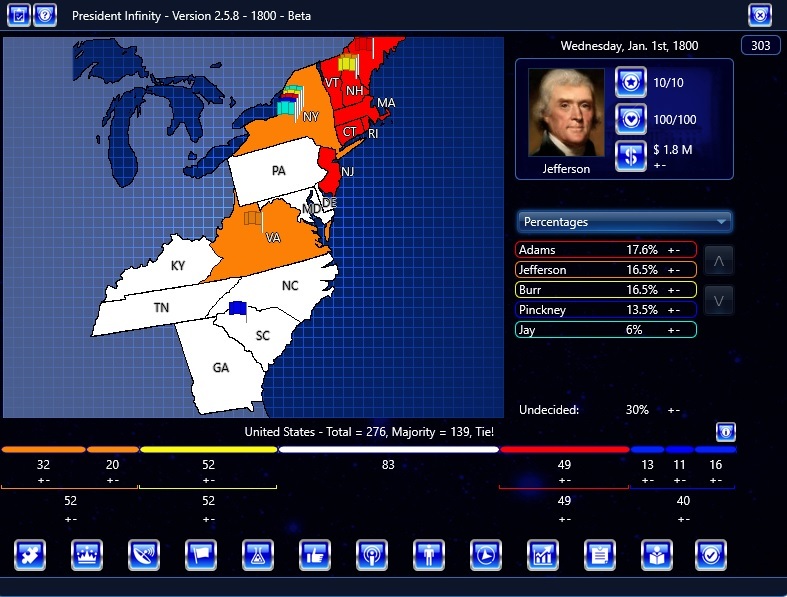 Combined attacks from Republicans and Hamilton threw Adams into a distant 3rd place in the election. Alexander Hamilton tried to convince NY Gov. John Jay to nullify the New York results when it appeared Republicans would take the state, but Jay refused. Jefferson won in a landslide, but the supposed vice president choice, Aaron Burr, ended up with the same number of electors, as an elector had forgot to give a vote to someone else to prevent a deadlock. It was well-known that Jefferson was the lead man on the Republican ticket, but Aaron Burr did not bend. The election went to the US House. After several tied votes, Alexander Hamilton made a surprise move by pressuring Federalists to give their Burr votes to Jefferson, who he believed had more principle, despite not being a moderate Republican like Burr. Hamilton’s influence handed the election to Jefferson, and made Burr vice president. Can you win reelection as Pres. John Adams? Can you upset Thomas Jefferson as Aaron Burr, winning the presidency from under the presumed winner’s feet? Can you fulfill Hamilton’s plan to land the presidency to Charles Coatesworth Pinckney? Can you secure a dark horse victory with John Jay? What if Alexander Hamilton tried to take control of the party from John Adams by running in the election himself? Could such a controversial candidate win? What if indebted Founding Father Robert Morris won in an attempt to resurrect his reputation? What if Founding Father Gouverneur Morris ran as another Federalist option? Can such an elitist win with a Jeffersonian tide in the country? What if Founding Father Rufus King, greatly respected by both parties, ran as a likable Federalist? What if Rev War officer Henry “Light Horse” Lee ran as a Southern Federalist? What if an Arch Federalist, such as 41-year-old Fisher Ames, ran? Could he win outside of Massachusetts? What if the 77-year old Samuel Adams make a last run for the presidency, despite failing health? What if former Northern Republican superstar George Clinton of NY made another attempt at the presidency? What if Founding Father Elbridge Gerry ran as a rare Massachusetts Republican? What if James Madison was too impatient, and opted to run for the presidency, even with Jefferson as the favored Republican? What if 41-year-old James Monroe, figurehead of the Conservative Wing of the Republicans, ran in 1800? What if George Washington’s freak illness in December 1799 had not killed him, and what if Federalists pressured him to run to prevent a Republican takeover?